A number of occasions arise where you need to downsacle and convert 4K videos on Mac OS X(EI Capitan). Such situations may occur if you made a 4K video in one different format but want it to be in a different format so that you can play, share or edit 4K videos on various devices or video editing applications smoothly. These and on many other similar occasions, you need a 4K video converter for Mac. The idea of a 4K video converter is to take your high quality 4K files and convert them into a supported format of your choice, ready for editing in older versions of software or into software that has not yet been updated for 4K support. In this article, we will introduce three excellent 4K Video Converter that will work on the Mac(EI Capitan included). You can choose from the top 3 4K video converter software for Mac to convert ultra high definition 4K videos. So now that we know that it is very essential in today's digital era to have the convenience of easily converting 4K videos to another on Mac, the problem then arises as to what the solution exactly is. EaseFab Video Converter for Mac is the answer to all your video related problems. So what exactly is EaseFab 4K Video Convertor you ask? Well, it is nothing but an amazing collection of features and tools that let you convert 4k videos as easily as you can imagine. 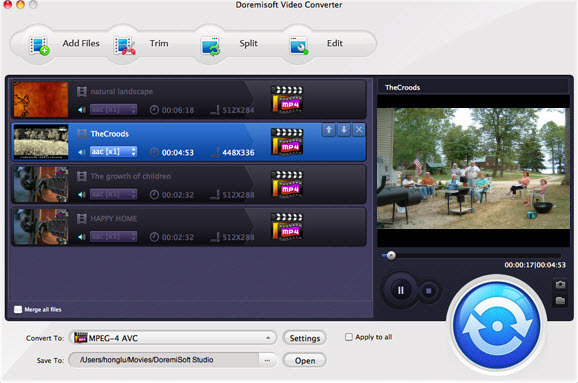 It's an easy-to-use, powerful yet professional Video Converter app for all Mac users. However, EaseFab Video Convertor is much more than just a simple convertor. Let us see what other amazing features does this piece of program has to offer. Priced at $27.96 (the cheapest professional video converter app on Market), you can also download a free trial to determine whether it is indeed the type of software that you are looking for. So first and foremost, the primary feature of this program is that it converts videos. However, the magic lies in the way it does that. With EaseFab 4K Video Converter for Mac, you can convert 4K videos into almost any format you can think of such as WMV, MP4, MOV, MKV, AVI and much more in SD/HD. You can convert any other formats of SD/HD videos as well. This top-ranked Video Converter for Mac supports convert 4K videos to various professinal encoders - Apple Intermediate Codec, ProRes and DNxHD, DVCPRO, HDV, MPEG-2 - ensuring maximum editing quality and efficiency when working with iMovie, Final Cut Pro, Avid Media Composer, Adobe Premiere and more. 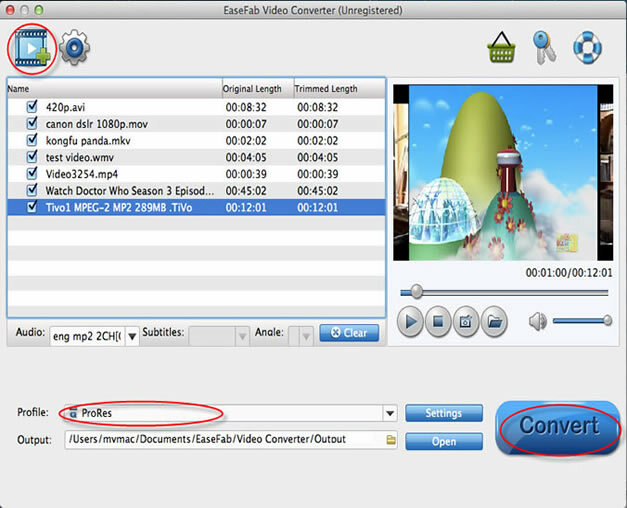 EaseFab Video Converter for Mac allows various kinds of users to use the program easily. No special skills are required. Whether you are a beginner or an experienced user, you will find it easy enough. Being tested with more than 10,000 video files, EaseFab Video Converter for Mac is assured the fastest video converting tool on Mac OS X (including the latest 10.11 EI Capitan and 10.1O Yosemite). It offers you an extraordinary 30X faster conversion experience with zero quality loss while converting 4K videos to H.264 encoded videos like MOV, M4V, M2TS, MTS, and many more. You can amazingly convert a 2 hour HD movie in 5 minutes with EaseFab software in hand. The Mac 4K video Converter comes with a built-in video editor, you can personalize and retouch your videos in clicks. All the smart video editing features lets you get a video with all the factors you prefer. You can trim, crop, add watermarks and more with your 4K videos. Options such as resolution, frame rate and bit rate can all be selected before you start the conversion process. With the smart 4K video converter for Mac, you can effortlessly convert your 4K videos to online video sites supported formats: YouTube, Vimeo, Facebook, FLV, SWF, F4V, WebM. EaseFab provides excellent customer support service, including lifetime free upgrade of product and technical support. Users can contact the support staff via email for help and suggestion. 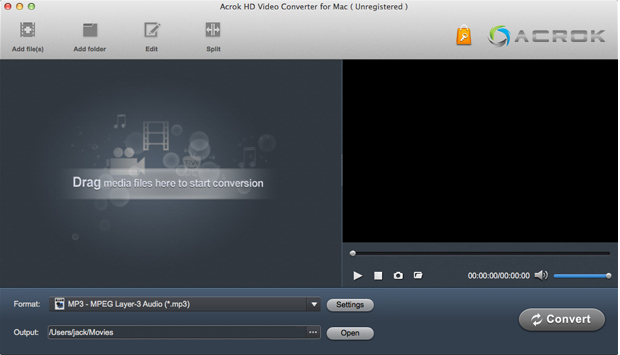 Acrok HD Video Converter for Mac is a comprehensive application that provides every type of conversion that you might need when you are working with 4K ultra high definition video files. Priced at $39, it's much more expensive than other 4k video converter apps on market. So which 4K video converter application is the best choice for you? As you can see, they have very similar functions, so it is simply a matter of experimenting; all the three Mac 4K Video Converter provide free trial versions so you are able to evaluate quickly before making a final decision.